ATVs are fun, there is no doubt about that. Whether you are an avid rider, or you simply like to go out on your off weekends and tear up the dirt, you will find, that at some point, you need ATV storage, especially when the ATV is not in use. No matter what, you need to make sure that the storage facility you choose to store your beloved ATV at is not only secure, but it has convenient access and features to help make your storing experience as good as can be. There are hundreds of choices when it comes to self-storage facilities in the US and you will find you are not limited in choices; however, you may be limited in what facilities can provide you with the best ATV storage experience. Below, we will talk more about what ATV storage is, the different types of leases available, some of the common requirements to store your ATV, and answer some questions you may have about storing your ATV. ATV storage is exactly what it sounds like – a place for you to store your ATV while it is not in use. You may be wondering whether ATV storage is the right choice for you and how you can benefit from it. First and foremost, we must point out the obvious here. ATVs are rugged, durable, and meant to take on those harsh terrains and conditions, but this does not mean they are free from damage when not taken care of. If you do not have a way to store your ATV on your property or at your home, a storage unit is the next best choice. You will have several different options on how to store your ATV, which we will cover in the next section. In addition, some of our facilities allow you access to your storage unit 24 hours a day, 7 days a week. These types of facilities have a manager that lives on site. When deciding to store your ATV, you will need to look at the different types of ATV storage options. Typically, you will run into three options which include outdoor, covered, and indoor storage. We will look at them a bit more below. One of the first options and likely the cheapest option available will be outdoor storage. This type of storage is just how it sounds, and your ATV will be outdoors and parked in a parking space. You can compare this type of storage closely to parking a car in your driveway – it is the same idea. Outdoor parking spaces are ideal for those individuals who want to store their ATV and do not mind providing some basic maintenance to it to protect it from the weather’s elements. You may also want to use outdoor storage if you have any type of equipment attached to the ATV such as a trailer. A step up from outdoor storage is covered storage and this option is perfect for anyone who does not want their ATV just out in the open. This option is affordable and falls somewhere between the price of the outdoor option and indoor option. Covered parking spaces are ideal for individuals who want to provide a bit more protection to their ATV. Of course, you would still want to perform maintenance on the ATV and cover it with a heavy-duty cover to protect it. Indoor storage is the last option and is the most expensive of the three, but it offers the most protection out of the options too. You will find that your ATV fits nicely inside of an indoor unit and often, you can drive right up to the unit and access your ATV. This type of storage is perfect for individuals who want to know their ATV is protected and it is ideal if you plan to store your ATV for long periods. 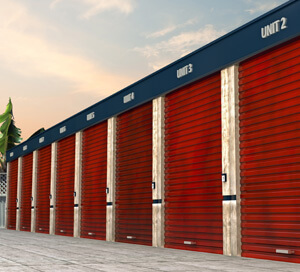 Before you head up to the local storage facility, you will first need to consider what size storage unit you need. Fortunately, depending on the type of ATV you have, you may be able to fit it into a small unit and save yourself some money along the way. A 5x5 unit is not very big and most ATVs will not fit inside of it. However, if you have a sport edition ATV and it is on the smaller end, you will find it fits perfectly in here. A 5x10 unit is a bit bigger than the unit size above but it can hold a variety of ATVs in it. For example, you could easily fit a sport, utility, or side by side ATV inside. You will not likely need a unit to be larger than a 10x10 or 10x15. A 10x10 unit is about the size of a one-car garage, so you have quite a bit of space. If you find that your ATV does not fit into a smaller unit, it will fit into one of these two. Typically, a side by side ATV that is larger than the standard side by side will fit into a 10x15 unit size. If your ATV has a trailer attached to it, then you will likely find that one of these options works. If the trailer is longer than the 10 or 15 feet, you will need to upgrade to a larger storage unit, so keep that in mind. When you find a storage facility you want to store your ATV at, you will need to think about the type of storage lease you want. You do have options and these options are more flexible than leases at other places such as apartments, dealerships, etc. A short-term lease is one that is usually less than six months but more than a couple months. These leases are ideal for you if you simply want to store your ATV for the winter months. You can end the lease when you are ready, which makes it a convenient option and you will not feel locked into anything. A flexible lease is one that is flexible and allows you to store your ATV as needed. This type of lease is best for someone who may only need to store it for a couple weeks or a month as they make a move or head out of town for a vacation. When you are ready, simply remove your ATV from storage and go on about your business. A long-term lease is one that is usually for more than 6 months and can last indefinitely or until you end the lease. These types of leases are ideal for someone who wants to store their ATV for a longer period. For example, if you are deployed in the military or if you stop riding your ATV but do not want to sell it. Storing an ATV is not as easy as driving it or placing it into a unit and being done with it. In fact, there are requirements that must often be met before you can store your ATV with a self-storage facility. Let’s look at what they are. 1. Must fit into the unit. Your ATV must fit into the unit that you have rented, and it must fit properly. This means that you cannot store the ATV on its side or in a dangerous position to make it fit. You must be able to get the ATV into the unit without a struggle. Often, storage unit facilities will require that the ATV be operable. This is so that tenants do not just dump the non-working ATV on the storage facility. You may be required to show the manager that the ATV works too. 3. Current registration and insurance in your name. It would not be uncommon for a storage facility to require that you have current insurance and a valid registration on the ATV. This helps protect both you and the facility should anything happen to the ATV or there be an incident involving the ATV. One of the nice things about ATVs is that you do not have to maintain them like you do a car. They are much easier to care for, which makes them a great choice for individuals who want them for recreational use but do not want to worry about the long-term care and monthly maintenance. While your ATV is durable and does not require the same level of care as a car, you cannot just stick it in storage and forget about it. If you want your ATV to remain well maintained and protected, you need to make sure it is well cared for, even in a storage unit. Below, we will talk about some of the steps you need to take to prepare your ATV for storage in a unit. Step #1: Clean your ATV. The very first thing you want to do before you store your ATV is give it a good cleaning. You should make sure to wash the entire thing from front to back and soap it up to remove any mud, dirt, or dust from it. Once you have washed and rinsed it, dry it. After it is dry, you want to apply a protectant to the outside of the ATV all over the plastic. This is wise as it will help keep the shell free from damage. You also want to spray out the exhaust pipe and any other metal parts with some WD40 to keep them lubricated and prevent rust. Step #2: Handle the fuel tank appropriately. You never want to store your ATV with gas, especially in a plastic tank. If you have a plastic tank, make sure you drain it or use the fuel up before you store it. You also want to remove any fuel from the fuel lines and carburetor. If you have a metal gas tank, you do not want to drain it. Instead, you want to fill it up until it is full and then add in a fuel stabilizer. You will need to run the engine once the stabilizer is added to distribute it throughout the engine. Step #3: Take care of the battery. When it comes to storing your ATV, you have two choices. You can either leave the in the ATV or you can remove it. This is a personal choice but if you do choose to store the ATV with the battery, you may want to consider a battery tender to help keep the battery charged. Step #4: Change your oil and filter. The oil and filter will need to be changed before you store the ATV. Allowing old oil to remain in the engine can lead to it gumming up and becoming a problem later down the road. Once you have changed out the filter and oil, allow the engine to run for about 10 minutes. Step #5: Put air in the tires. As your ATV sits in storage, the tires will begin to deflate and if you store the ATV with tires that are not filled with air, you will find that a flat spot is created on the tire, especially if the tire is not rotated. You have two options. First, you can fill up the air in the tires to the max point and then periodically add air as needed. Or, you can lift the ATV up using cinder blocks. Step #6: Cover up the ATV. If you store your ATV in an indoor unit, you do not have to cover it up unless you want to. If you store the ATV outside or in a covered spot, you should always have a cover on it to ensure it is protected. Do I Need Insurance to Store My ATV? Insurance for your ATV while being stored is always a good idea. This specific type of insurance is a policy that covers your self-storage unit. You will find that the monthly payment is relatively cheap to secure your belongings. You do not need to have insurance for your self-storage unit, but it is recommended when you store high-value items such as an ATV. Below, you will find some frequently asked and answered questions about ATV storage. What type of leases are available to store my ATV? There are multiple lease options available to store your ATV. You will find that you can choose short-term, long-term, and flexible lease options. Do storage facilities provide me with security for my ATV? Most storage facilities provide security features on the premises that will help ensure the protection of your ATV. 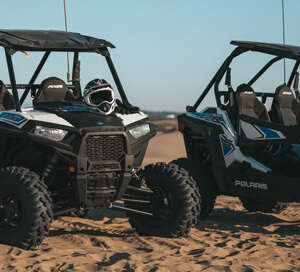 Unfortunately, storage facilities cannot take individual responsibility for the security of your ATV and you will ultimately need to make sure you purchase a lock for your unit and secure the unit. Some of the amenities you can expect a storage facility to have include gated access, access codes, video surveillance, alarms, and more. Can I store more than one ATV at a storage facility? Yes. You are not limited on the number of ATVs you can store if the facility has room for them. In fact, if you choose a large enough unit, you could store multiple ATVs inside. What is the main difference between indoor and outdoor ATV storage? The main difference between indoor and outdoor ATV storage is that when you choose an indoor unit, your ATV is completely enclosed, and you can add additional security measures such as a door lock. When your ATV is outdoors, it is in a parking space and you will need to cover it to ensure it is protected while you are away. If I store my ATV outside, how will I know it is safe? You may be nervous about outdoor storage for your ATV and you have every right to worry. It can be hard to leave your investment behind, especially when it is not enclosed. Most storage facilities have video surveillance, gated access which requires an access code, and a manager living on site. 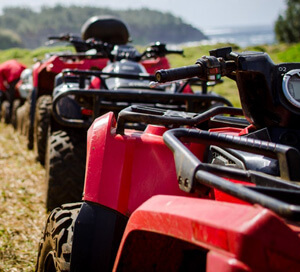 If you are worried about the security and safety of your ATV, you can insure it and search for a storage facility that offers security features that give you the peace of mind you want. Storing your ATV is a convenient option and very affordable. If you need to store your ATV, you can choose from several lease options that allow you to store your ATV for two weeks up to two years or longer. When you search for ATV storage near me, look for facilities that are designed to provide you with the exact type of storage you want. You will find that you have the option of indoor, outdoor, and covered parking. The choice is yours when it comes to which one you are most comfortable with. As you do search for the perfect ATV storage unit, make sure you check out the facilities first and see what they have to offer you in discounts, security, and amenities.